We are Obladee (yeah like that song by The Beatles), a Brand identity design studio based in Swindon, Wiltshire, creating design solutions since 2008. We have a passion for creating stunning identities, graphic design, and getting our creative minds into the heart of your brand. Sure, we create great logos, but we love to delve deeper. Working with you to understand your personality, your passion, your business and turning that into something bigger than just a logo. We create everything you need to take your brand to the next level and to be more successful. Comprehensive branding and market research exercise to create the perfect company identity for you. A new logo and branding aligned to your values and position in the industry with a vision for growth. A holistic approach giving you all you need to achieve the best for your company now and in the future. When we moved to our new bigger premises we wanted to take our look up a level to reflect this. 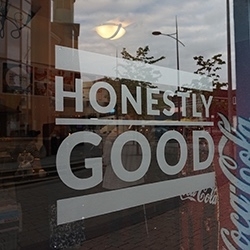 Obladee worked with us to create more than just a refreshed logo, they created three statements that really capture what we stand for and we liked them so much we have them nice and big on the windows on the front of the shop.